For my first proper countdown post – as we await the release of all thirteen episodes of Daredevil on April 10 – I wanted to take a look at some of my favorite stand-alone issues of Daredevil. Not all of these are perfectly self-contained, of course, but they stand well enough on their own that you don’t need to know much going in, and you get a full story with each issue. The issues I chose for this list also meet the criteria of being reasonably friendly to new readers and at least minimally relevant to the Netflix series. That last bit would really only exclude stand-alone issues like Daredevil #92 (vol 2) which is told from the perspective of Milla Donovan and deals with her and Matt’s relationship. It wouldn’t make my list anyway, but since Milla isn’t going to be in the Netflix series, I wouldn’t even consider it. Having said that, I should also mention that while technical quality is certainly an important consideration, I’ve put greater emphasis on whether these issues have important things to say about Daredevil and/or other characters or can serve as a good introduction to Matt Murdock and his world. Let’s get started! All issues are listed in chronological order, not by individual merit. This issue, written by Roger McKenzie, and penciled by a very young Frank Miller does require some background information going in, namely that Ben Urich is a journalist who, over several issues, has begun to piece together that Matt Murdock and Daredevil may be one and the same. 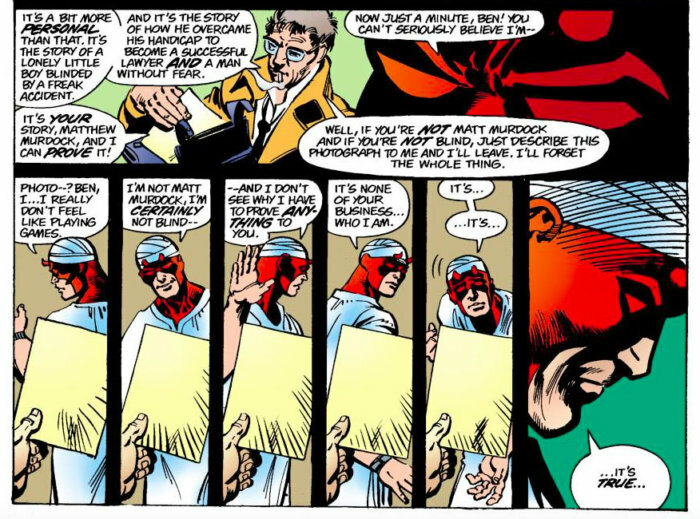 Daredevil is in the hospital after a recent bout with the Hulk, but that’s not really relevant to what happens next, which is that Urich confronts Daredevil with his findings. After Daredevil fails to identify a photograph of his father, he confesses and begins to tell the journalist about his life. This issue marks the beginning of the close relationship between Matt and Ben, and is important to the continued stories of both characters. Ben Urich gradually uncovering Daredevil’s true identity was an important plot element in the 2003 Daredevil movie, and we can likely expect elements of the same in the coming Netflix series where Ben Urich – played by Vondie Curtis-Hall – is a central character. If you want to know how it all began, and get a bonus recap of Daredevil’s origin, this is a good place to start. I’ve also written extensively about this issue and the ones leading up to it in the post “Meet Ben Urich” from 2008. Where can I find it? This issue is included in the first volume of the Daredevil Visionaries: Frank Miller trade paperback, as well as other collections that cover the same era. It is also available on the Marvel Unlimited digital platform. Daredevil #191, written and penciled by Frank Miller (with inks by Terry Austin) may be my very favorite single issue of Daredevil. It is the perfect stand-alone story in that, while it certainly helps to know who Daredevil and his nemesis Bullseye are, it’s not crucial to appreciating the story. The artwork, with generous amount of negative space, interesting panel layouts and elegant simplicity, is the perfect match for a story that does a perfect job of nailing down, defining and explaining Matt Murdock. This issue showcases his fears and weaknesses through the torment he suffers, not just in the wake of Elektra’s death, but in the way he feels complicit in the shooting of a young boy by being, not just a hero, but a role model for violence. I have nothing negative to say about this issue, it’s as close to perfection as they come, and it’s truly innovative in its approach. See also my previous post on this very issue. Where can I find it? This issue is also easy to find in the many collection that cover this era. Of course, it’s also available on the Marvel Unlimited digital platform. Another great one-shot is writer Alan Brennert’s sole contribution to the Daredevil archives, with art provided by Klaus Janson. It’s just a nice little slice-of-life story focusing on Ben Urich (more so than Exposé above, which is really more about Daredevil’s own story), but also featuring plenty of insight into Daredevil, as well as the Kingpin who also makes an appearance. You also get a great sense of Daredevil’s world and the corruption that runs rampant in it. The story revolves around good people doing good, good people doing bad, and the many shades of gray in between. It also reminds us never to presume to know what anyone else is going through, and doing the best with what we have. It is a tale which is both tragic and optimistic, and surprisingly moving. Where can I find it? This issue hasn’t never been collected and isn’t available through Marvel’s online channels so look for it in back issue bins. On the surface, The Price, by Denny O’Neil and David Mazzucchelli, may appear a little campy. The Beyonder appears in Matt and Foggy’s office and asks them to argue his case, a case that is pretty much based on the alien visitor’s wish to own the entire world. It’s certainly a little out there. 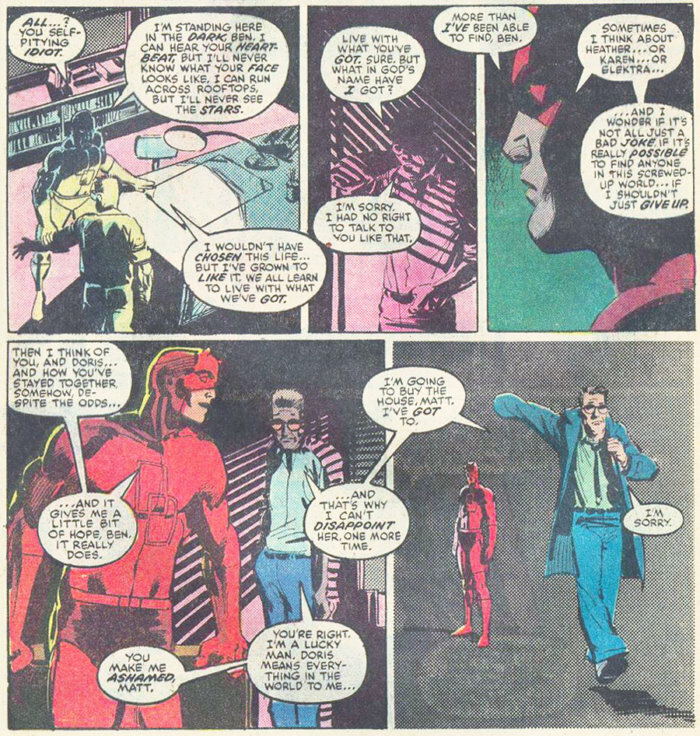 As is what happens to Daredevil during the course of the issue when the powerful Beyonder restores his sight. The outlandish aspects of the story aside, this issue is surprisingly moving. It’s really the first time that Matt has had his sight back and actually been able to enjoy it for any length of time. The experience is also pretty heartbreaking for out main character who has to deal with some delayed grief when he realizes exactly what it is he’s been missing all these years. In the end though, he decides that he cares about his principles even more than this new gift. It’s pretty powerful stuff and says a lot about the character. I’ve written about this issue before as well. On the title page, 34 Hours is introduced as “A story about New York.” This sums up the issue well, and also explains why I love it so much. I like this issue almost as much as Roulette, as they both do a fantastic job of stripping away the fuss and focusing on what makes Daredevil such a great character. Aside from that, the two issues really don’t have much in common though. Where Roulette is tragic, 34 Hours is brimming with optimism. The latter issue, by D.G. Chichester and Ron Garney, is also much more traditional in its format. I’ve written about this issue before as well so I recommend giving that post a read for more information on this tale of a day in the life of New York and the title character! Where can I find it? Sadly, this issue hasn’t been collected either and also isn’t available through Marvel’s online channels so look for it in back issue bins. The very first issue of Daredevil, by Stan Lee and Bill Everett, is actually pretty good. It does a good job of introducing this brand new character, uses quite sophisticated storytelling techniques, and obviously managed to capture enough interest to make up for the very inconsistent quality of the first couple of years of the title. Also by Ed Brubaker and David Aja, this issue is all about the Kingpin, and his new life in Spain where he finds love again after the death of his wife Vanessa. It all comes to a tragic end, of course, but the story really highlights the complex nature of the Kingpin, something which appears to be a big part of the Netflix series. This stand-alone Christmas issue by Mark Waid and Paolo Rivera is another favorite of mine. Waid and Rivera skillfully take Matt out of his element as he goes on a school trip with a class of blind school children and they’re stranded in the woods after a bad bus accident. I like the idea of Matt doing volunteer work. It goes well with a character who’s always cared about his community, regardless of what costume he’s wearing. Well, that’s it! What did you guys think of my choices and what are some other issues you’d like to add to the list? Let the rest of us know in the comment section! You listed 2/3 of my favorite issues. The Price is my all time favorite. The class trip is my favorite in the last 10 years. The other one not on your list that I love is the crossover with Spider-Man called reasonably “Spider-Man/Daredevil”. It shows one day in the life of both characters as they independently try to rescue a kidnapped child. Can’t comment on many of the others, since I haven’t been able to read all of volume one yet. Great choices all. Especially “Roulette”, “Guts”, and Waid’s Christmas issue. Issue 375 by Joe Kelly and a host of artists. Its not really “stand alone” but it works fairly well by itself as the important aspects of the preceding issues are recapped in Karen’s trial. Great moment where Karen asks Matt if he would let her go to prison knowing she was innocent if the trial went bad. He couldn’t answer her and I thought it was great portrayal of how the system doesn’t work a lot of the time and Matt’s obsessive devotion to the law. The inconsistent art is the only thing that brings the issue down. The final scene between Murdock and Fisk perfectly illustrates their relationship. Possibly the pinnacle of Frank Miller’s artistry as a visual storyteller. Sadly not in any way part of official continuity, but this story perfectly encapsulates Matt Murdock’s psyche and how damaged he is. Its a great prelude to Born Again. I actually consider this part of my personal Daredevil canon and just imagine that Elektra and Bullseye were resurrected somehow in some other Marvel story that I just never read. Cool list, Christine. Big fan of Expose and Guts as well. Have you noticed that Comic Book Resources are doing a vote on the all time 50 DD storylines? Voting closes today so be quick! I personaly love Daredevil 252, in which the colateral damage of the X-Men vs Apocalipsis first mambo creates a collective panic. Confused people believe a nuclear war has started, and Manhattan becomes a post-apocaliptic nightmare for a few days. Only the Man without Fear keeps calm and instils sanity in other around him. When wannabe warlord Ammo raises a horde of madmaxian barbarians to sack an hospital, Daredevil gathers policemen and civilians to stop them and insists them to not use deadly force. 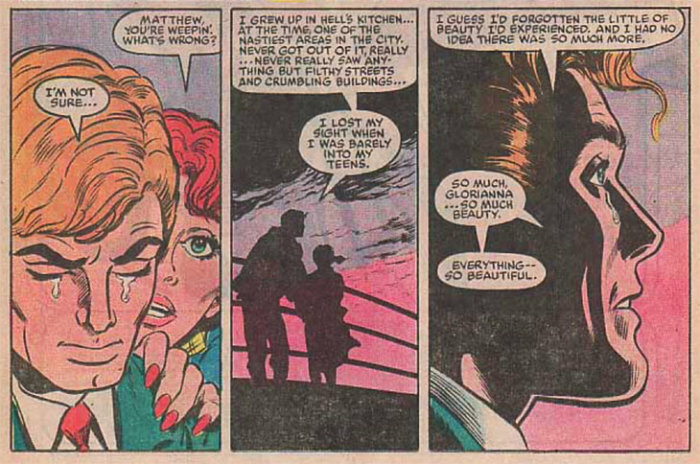 Later, when his young friend dies in his arm, asking for Matt Murdock, he nearly unmasks himself (in the middle of a multitude) trying to confort him. For me, this is Daredevil best qualities at his best. Courage, principles, humanism. While we enjoy Matt low points as a show of his humanity, we shall also remember his best moments as a hero. Also, in this story Matt is still Matt so Ammo brutality sicks him, and beats the creep to a pulp. That’s my boy.